Piercing rivets or self piercing rivets has revolutionised the water tank manufacturing process by slashing cycle times, reducing the number of assembly staff and improving the joint quality and pull up force between the overlapped sheets which have a sealant layer between. Large C frames with 1000mm throat depths are used to apply the rivets to the tank walls. 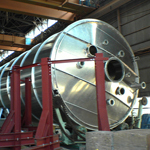 Silos were first joined with SPR in the early 1990’s. 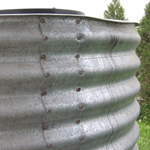 These silos are manufactured in a factory using thin gauge galvanised steel and transported to site. They will typically have a grain capacity of up to 150 tonnes and be up to 5 metres in diameter. The use of SPR allows these very large and cumbersome structures to be manufactured with some levels of automation and much greater efficiency than blind fasteners or welding processes. Sealant is used in all the overlap joints to make the complete structure airtight.